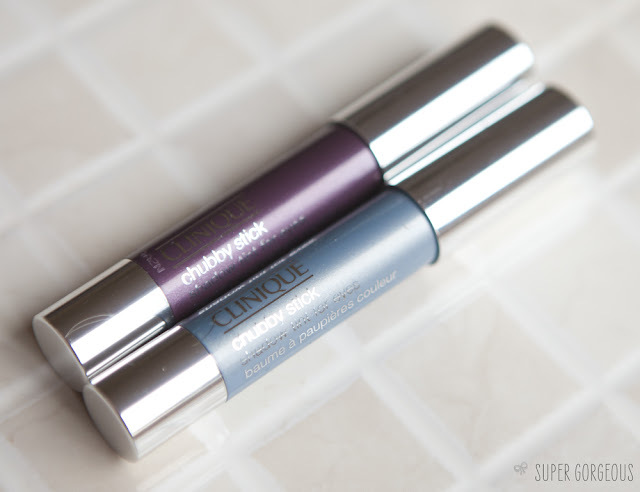 When the nation went crazy for Clinique's Chubby Sticks for Lips, it seemed natural for them to extend the range. The Chubby Sticks are a perfect design for easy application on the go and next week, they are introducing 12 shades for the eyes to the Chubby Stick range. I went down to the Clinique Head Office last week for their launch, which featured a cute little candy shop and teeny milkshakes from bottles... and got to play with all 12 shades of the new Chubby Sticks. I was given 2 to take away with me - was complete luck of the drawer as to which 2 that would be - I ended up with Portly Plum and Big Blue. 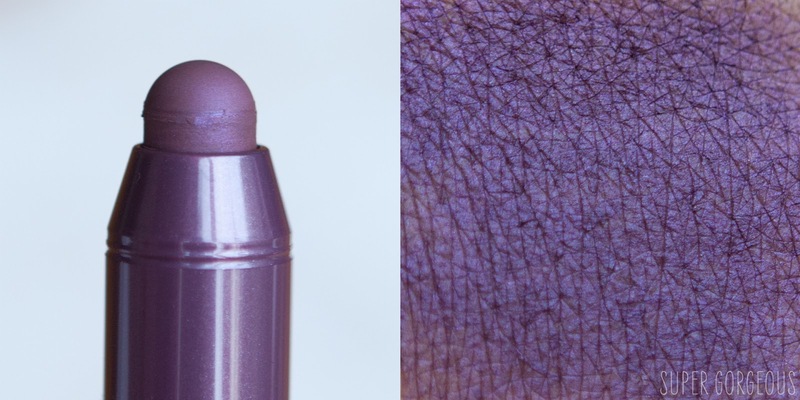 The outer design is exactly the same as the Chubby Sticks for Lips - they are in a crayon shaped barrel and removing the silver lid reveals a crayon-like product, which you twist the base of to get more of the product out. 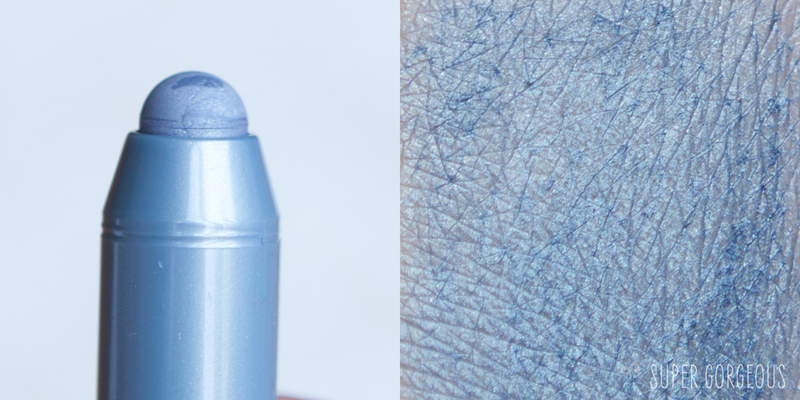 The only noticeable difference is that Chubby Sticks for Eyes are rounded at the end for easy application to the eye lid, while the lip version is pointed to apply to the lips with ease. Neither of these are shades I would have picked out - my initial reaction would be to go for the neutral and bronzey shades (Whopping Willow Fuller Fudge and Ample Amber in particular, I'm talking to you!) which, with about 5 different tones, are just gorgeous. However, I seem to be having a little affair with purples at the moment, so was pleased I got to try out Portly Plum. It is a dusky purple with a hint of pinky purpley iridescence. Big Blue reminds me of the colour of Cinderella's dress - it's a very pale blue with an almost frosty finish, with pale blue iridescence. I found it to be a purpley brown on the eye which is right up my street, so will definitely wear it again! I'd also like to try it as a base to eyeshadows - I think this would look great with a black smokey eye over the top. There are some lovely ones there aren't there?! 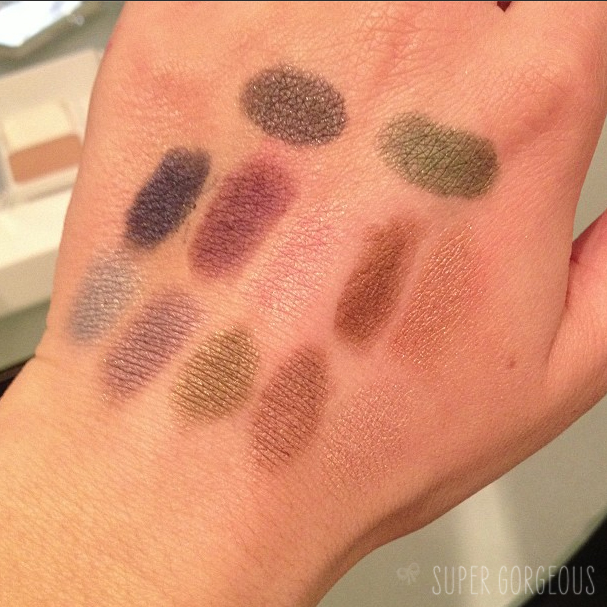 Love the greens and neutrals :) the plum looks gorgeous with your brown eyes! Wow, lovely colours! Might have to get one, although £16 is a lot for one colour! Looks lovely!I would go for the bronzey colours too!! I love shadow sticks like this. Makes me feel less guilty about hitting that snooze button in the morning, they are so quick and easy to use!